Facebook can be an incredibly useful platform for reaching new customers and maximizing the value of customer relationships. However, as the number of users grows (1.28 billion daily users and counting), so do the risks of spending budget on the wrong audiences, thereby increasing spend and acquisition costs for your business. It is more important than ever to be highly strategic with your Facebook Ads campaigns and budget. When we build campaigns with the goal of acquiring new customers for clients, one of our go-to tools is Lookalike Audiences. Lookalike audiences are groups of Facebook users that share similar attributes to your existing lists (customers, prospects etc.). You upload your list to Facebook and the algorithm builds your Lookalike Audience of new targeted prospects. This is already an effective tool for spending more efficiently and it just got even better. 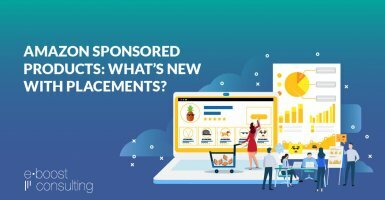 Last week Facebook released a new feature that will give us even more control over funneling budget to the most potentially valuable customers. 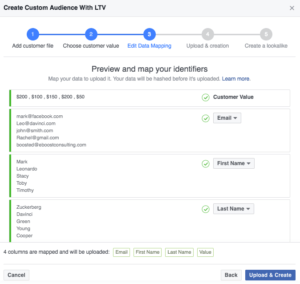 Facebook is now giving us the ability to include Lifetime Value (LTV) data within custom audiences. 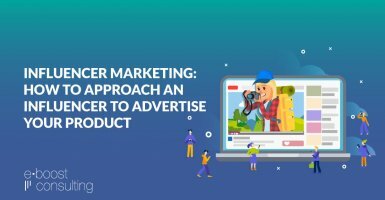 enabling businesses and marketers to cost-effectively target their highest value customers as well as find new people with similar characteristics. 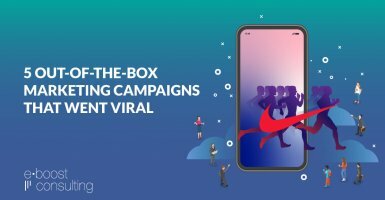 The potential pay-off for these kinds of campaigns is huge and we’re just getting started exploring the possibilities with this brand new feature. 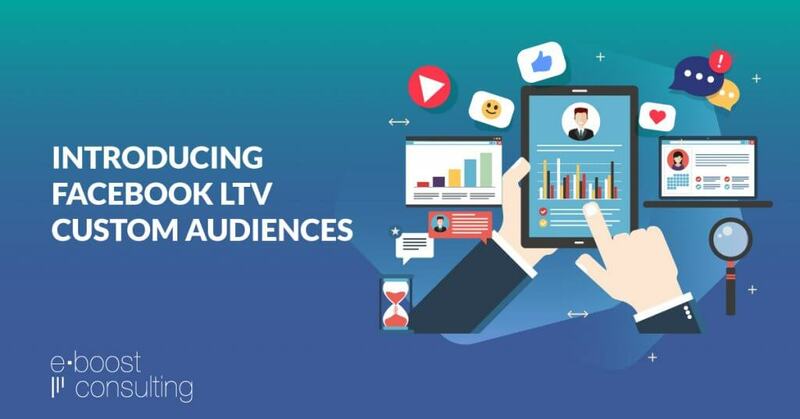 Here is a step-by-step guide based on our own processes to help you start testing out LTV Lookalike Audiences on your own campaigns. 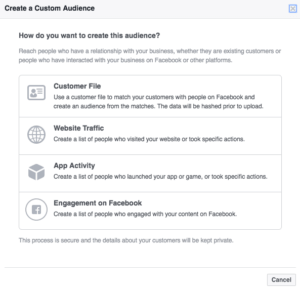 Before you start building audiences within Facebook, it is important to understand your own underlying business drivers and goals. What specific buying behaviors make these customers so valuable? What metrics can you use to best quantify and track this? A little strategic work up front is well worth it. 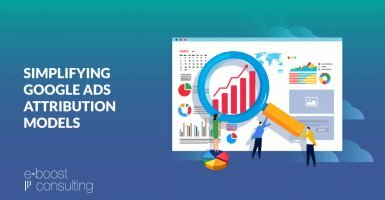 When you’re optimizing campaigns and deciding where to cut budget and where to spend you’ll be glad you have this information clearly defined and actionable. You can only target your best customers (and people like them) when you know who they are and what (specifically) makes them so great. How much does the customer typically spend? How often does the customer make a purchase within a certain time period? Your estimate of how much the customer will spend with your business over the course of the future relationship. The overall value of the potential length of the relationship. The factors you use to determine customer value will be unique to your business. Think about the attributes your best customers share and start to define your metrics from there. Next you need to format your data so that it adheres to Facebook’s guidelines. 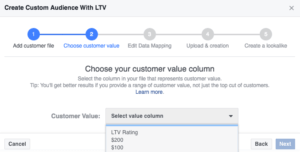 LTV values should be entered as positive values within a separate column of your data file. Remember to rank all your customers and not simply those you wish to target. 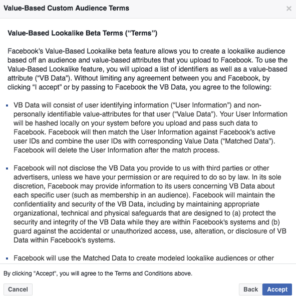 Facebook lookalike matching will not run optimally with partial data. It is possible to rate your customers using rating systems such as 1-10 or dollar values, but remember consistency is key. Notice that LTV Value can be based on a number scale or actual $ LTV assigned to customers. * For more information on Facebook Customer data preparation and best practices click here. 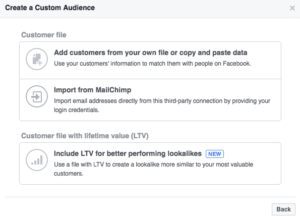 Just as you typically create a custom audience, upload your customer file to Facebook with included LTV ratings. 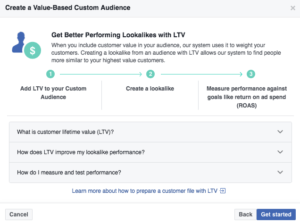 Now that we have our LTV Lookalike Audience in Facebook we can build ads and campaigns around it, test performance and optimize to maximize Return On Ad Spend (ROAS) just like we do with any other campaign. 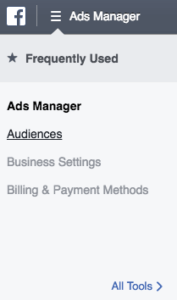 After Facebook introduced this feature last week we got right to work on implementation for clients. We launched some initial campaigns and are now starting to get back some usable data for optimization. Initial returns look good but it’s very early. 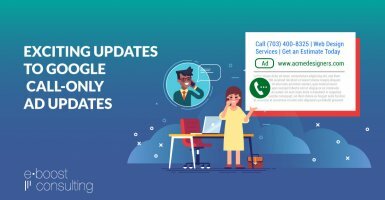 We’ll continue updating the blog as we gather more information on the effectiveness of these campaigns and we will continue sharing what we learn with you. 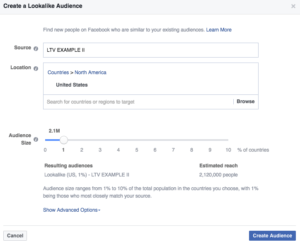 Have you tested LTV Lookalike Audiences on Facebook? Tell us about your experience in the comments. Do you need some help setting up your campaigns? Learn more about our Facebook Ads Management services to see if we’re a good fit to work together. If the bottom portion of the list has customers worth $10 and $20 and the top has customers worth $1000-3000 wouldn’t it be better to even remove anyone below say $100 or even more? Hi Alex – good question. 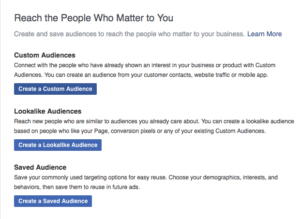 Facebook weights the higher value customers as higher based on the data you upload. If you have an ecommerce site, I recommend including total number of purchases or total revenue per customer. Facebook then creates the lookalikes using that data to comprised of people that are more similar to your higher value customers. 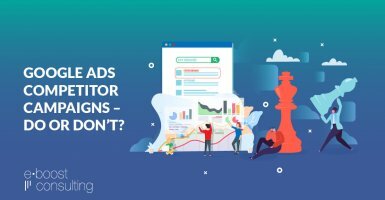 The campaigns themselves aren’t necessarily optimized toward these customers but if you use a value-based lookalike in your targeting, the audience should be comprised of people more similar to your best customers. 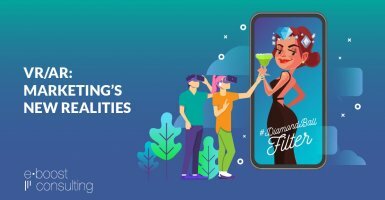 The optimization would come from your pixel data – how you’re optimizing and the data you’re sending back to Facebook. 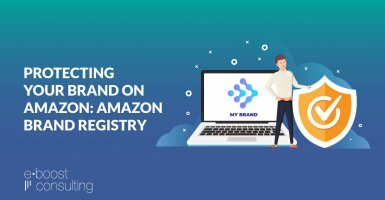 In terms of manually removing the lowest-value customers – that’s certainly an option and whether we’d recommend doing that is based on your list size. Custom audiences that are the source list for lookalikes should be no less than 1,000 people and in general no more than 50,000 people. So if your list is over 50,000 you can manually remove the lowest-value customers but if you’re on the lower end of the threshold we’d recommend uploading your full list. Yep, we recommend including all customers in your source lists for LTV-based lookalikes. The only scenario where we would try manually excluding the lowest value customers is when you have a very large source list of 50k+. And even then, it’s always best to test both lists and see which performs better. Awesome! Can’t wait to test it out on my campaigns. Thank you for sharing this info. This is great! 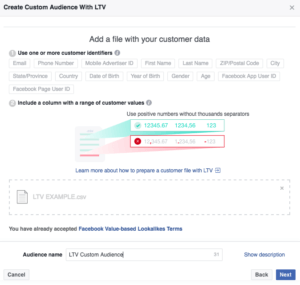 I had heard about LTV Custom Audiences but didn’t fully understand it. This was really helpful. You guys rock!